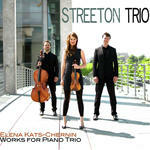 Intermezzo Days : piano trio / by Elena Kats-Chernin. Commission note: Commissioned by John Strutt for performance by Musica Viva Australia.. Commissioned by John Strutt for his wife, Jo. 23 Nov 2011: at Huntington Festival (Huntington Estate Winery). Featuring Kristian Chong, Sophie Rowell, Rachel Johnston.